Meow. 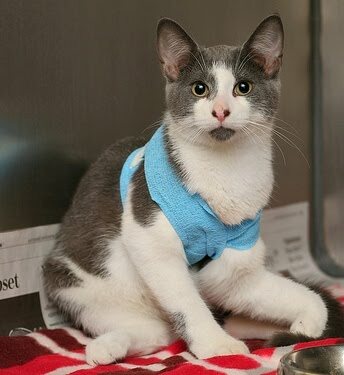 My name is Dustin (A111816) and I am six months old. Even though I’m pretty young, I had a rough start to life. In fact, I spent much of my time living on the streets. They can be a pretty dangerous place, as I found out just a few days before Christmas when I injured my leg pretty badly! I was very cold and very scared because I wasn’t sure anyone would find me and give me the help I needed. Luckily, someone heard my meows of pain and called the Ottawa Humane Society (OHS). An emergency agent came right away to help, but because it was so late at night, I was taken to an after-hours veterinary clinic for help. The staff there were so nice to me and gave me pain medicine right away make me feel better. Once the medication kicked in and I began to calm down a bit, the agent brought me to the OHS. The veterinarian there did some X-rays and told me that my leg was so damaged that it would need to be amputated. Unfortunately, while I patiently waited for my surgery date in the shelter, I contracted upper respiratory infection (URI), which is like a bad cat cold. Because I was in such rough shape and needed constant monitoring, one of the vet techs at the OHS decided that she would foster me in her own home so I could get healthy as quickly as possible and get ready for surgery. I am currently resting and looking forward to finding my new forever home once I’m well enough! Please help Dustin, and other animals like him in need of emergency animal treatment, by making a donation.